This article helps explain why as Christians we are interested in world events as they relate to the Bible. Perhaps you are wondering what all this means, or why would someone go to the bother of collecting a bunch of news articles which somehow relate to prophecies in the Bible which were written thousands of years ago. Nobody can deny all these things have happened, or will soon happen. They are in the news almost every week. But what does that mean for us? The Bible foretold all these things would happen, shortly before the Lord Jesus Christ returns to earth as King of Kings and Lord of Lords. But before that, the Lord Jesus spoke of a time of great trouble that would come upon the earth (Mat 24:21, "For then shall be great tribulation, such as was not since the beginning of the world to this time, no, nor ever shall be"). According to Daniel, the head of the European Union will broker a peace deal in the middle east that will appear to solve all the problems. The deal will be agreed for a period of seven years (Daniel 9:27). Under it, the Jews will be permitted to rebuild their temple, and the sacrificial system will be set up again. There will be a period of relative calm, but it will be short-lived (1 Thessalonians 5:3). Halfway through the seven year period, the Antichrist (the head of the EU) will turn his back on the agreement and stop the sacrifices (Daniel 11:30). He will sit in the Jewish Temple, and proclaim himself to be God (2 Thessalonians 2:3-4), and cause as many as would not worship him to be killed (Revelation 13:15). He will deceive the whole world, as Satan will enable him to do great "lying wonders", such as call fire down from heaven (Revelation 13:13-14). There will also be terrible disasters occurring on earth during this time, among which are war (Revelation 13:4), the greatest earthquake the world has ever seen, destroying all the great cities of earth (Revelation 16:18-19), a possible meteor strike causing mass extinction of sea life and vegetation (Revelation 8:7-9), water problems (Revelation 8:10-11), terrible pollution causing the sun to be darkened (Matthew 24:29), problems with the ozone layer (Revelation 16:8-9), killer hail stones (Revelation 16:21) and much more. Revelation states that a fourth part of earth's population will die because of these things (Revelation 6:8). The Antichrist will then gather his armies, along with all the armies of the world for the "final solution", to take control of Jerusalem by force, and wipe out the Jews once and for all (Joel 3:2). 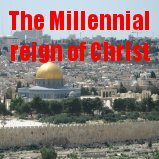 As the seven year period comes to a close, the Lord Jesus Christ will return with the armies of heaven, to defeat the Antichrist and his armies and save Jerusalem, and set up His kingdom on earth (Revelation 19). So as you can see, if what the Bible was one hundred percent accurate about what we see happening around us now, we really need to do something now in order to prepare for what the Bible says is still to occur. But unless you have accepted Jesus Christ as Lord, you can never enter into His kingdom (John 3:3). Without your sins forgiven, you will never be allowed into heaven, as heaven is a place of perfection, and God is holy and cannot look upon sin. In order to forgive sins, God requires that an innocent life must be taken in the guilty's place (Hebrews 9:22). But the Lord Jesus Christ came to earth two thousand years ago in the form of a man to suffer and die on a cross, as the final sacrifice for the sins of the whole world (Hebrews 9:26). God was well pleased with His sacrifice (Isaiah 53:10), and raised Him again from the dead as a testament to this (Luke 9:22). It is now through faith in His Son, in His death as the punishment for our sins by a Righteous God, and believing that He took the punishment we justly deserved, that God can forgive our sins and give us eternal life in heaven (John 3:16). All you need to do is repent of your sins, and accept by faith that Jesus Christ bore your punishment for them, and God has promised to save you (Acts 16:30-31). "For by grace are ye saved through faith, and that not of yourselves, it is the Gift of God; not of works lest any man should boast", Ephesians 2:8-9. 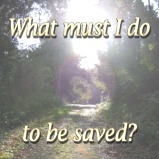 Jesus Christ promised that He would someday return to take those who have trusted in Him to heaven (John 14:1-6). As Christians, we aren't looking to see the fulfilment of all these terrible disasters on earth, we look for Christ's return for us. For He said, "when these things begin to come to pass, then look up, and lift up your heads; for your redemption draweth nigh", Luke 21:28.